At Cherry Energy, we pride ourselves in putting the best energy solutions to work for you – our valued residential and commercial customers. Our expert team of certified technicians will get your project done quickly and correctly, completing the job with minimal disruption to your family or business. And we’ll get it right the first time, too, with no need for inconvenient follow-up visits. Our friendly and helpful installation team will guide you through your project from the initial consultation through end-of-project support. Consultation – We’ll meet to discuss your project and make sure we understand your goals and priorities. Planning – Based on our discussion, our team will come up with options that make sense for your project and begin to draft a plan for your approval. Quote – Our design and installation teams will present options to you, providing cost estimates and making sure that the solutions we propose are tailor-made to your project specifications. Pre-installation – We’ll guide you through any planning requirements needed for your project and start arranging the installation. If you need LEED or other certifications we can arrange these for you. We will always schedule installations and arrange material deliveries at times that are most convenient for you. Installation – Our installations are performed to minimize disruption and maximize time and cost efficiency. Our experienced contractors and technicians are on hand throughout the installation process to help you understand what they’re doing and why. Post installation – We will be available to answer any ongoing questions you have in the years to come. We also provide you with peace of mind that our installations are backed by our warranty as well as manufacturers’ own warranties. Ready to get started on your next project? 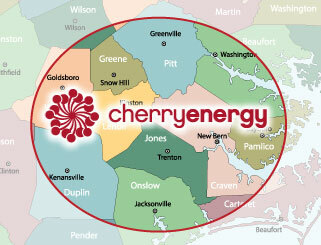 Contact Cherry Energy today.